God, I'm looking forward to Comic Con. Anyhow, hope your book is selling like crazy! P.S. An "unprofessional crack-whore" That's actually funnier than I realized. As far as Nora goes, I do have to say that she wore the coolest shoes ever. As far as the debate goes? Um ... who cares? Wear what's you. Wear what makes you feel good. Clothes are an expression of oneself. Down with the dress code! It's something I've been unable to articulate so I didn't even try in the midst of the firestorm, but it was and wasn't a gimmick. It was and wasn't a costume. It just was...and it also wasn't. I was just being me in a marketing sort of way. That being said, Jason I personally don't see what's wrong with doing what you want/need to promote your books--gimmick or no gimmick--especially if you do not have publisher support doing it for you. Half the time the publicity departments don't even respond to calls or emails from random authors at my level in the midlist. It's all well and good to write a great book, but if nobody has heard of you, nobody sees the book, and nobody has a reason to look...well, there's the problem. Wired is my seventh full-length novel. I doubt that a solid 50% or higher of the people who found out about me after my thighs became a national crisis could have named one of them in spite of the acclaim some of them have received. (Alas.) Maybe they can now. Apropros to nothing much, but my husband took the picture of Sherry's hat. Also, I went to dinner with my editor, Birgit Davis-Todd, and we discussed THE MARK at length! I LOVED the hat. LOVED it. Hey Liz, thanks for dropping by! When we met at BEA, I definitely thought you stood out, but in a "that's a neat outfit" way, not a "good god, what is she wearing?!?!" way. Bottom line, from a marketing standpoint, I remembered it. Alison, first off, thank your husband for the photo! Second, I agree, that if you write a certain kind of book, your readers might have an expectation as to your demeaner and/or appearance. Last year at the pre-Edgars party at the Black Orchid, Harlan Coben was wearing a Hawaiian shirt and shorts while everyone else was in suits. And if you read Harlan's Myron Bolitar books, you'd certainly think, "This author seems like the kind of guy who'd wear Hawaiian shirts." I think there's a big difference between dressing the part and standing out, like Liz and Marianne did, and purposefully drawing attention to yourself in an unflattering way. 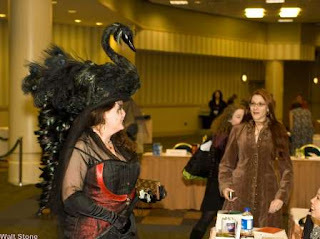 Like Liz, I'm sure Sherrilyn's many fans loved the swan. Really every aspect of a book's publication is, to some extent, marketing. Look at author photos. Most thriller/mystery writers look grim, solemn, MYSTERIOUS. Having met many of them, they are NOT grim people. They're unbelievably nice, almost weirdly so for people who write about murder and mayhem. But there's a perception there, we WANT people to think we're mysterious to some extent, just like you wouldn't trust a skinny chef, you might not trust a thriller writer wearing a Smurfs t-shirt. And I think it's ok provided you're being true to yourself, your personality and your book in some way. Although I would be frightened of any author who wore a Smurfs t-shirt. Liz Maverick, I think you looked FANTASTIC and you have nothing to be ashamed of. It's supposed to be fun, isn't it?